Razor8 Blast Powder has Absolutely No Fillers! Razor8 Blast Powder is Unadulterated and Unapologetic Strength. Pure, Direct and Extreme. Razor8 Blast Powder contains a full 4 g of Creatine and 1 g of highly bio-available Creatine HCl for rapid increases in Strength and Size. 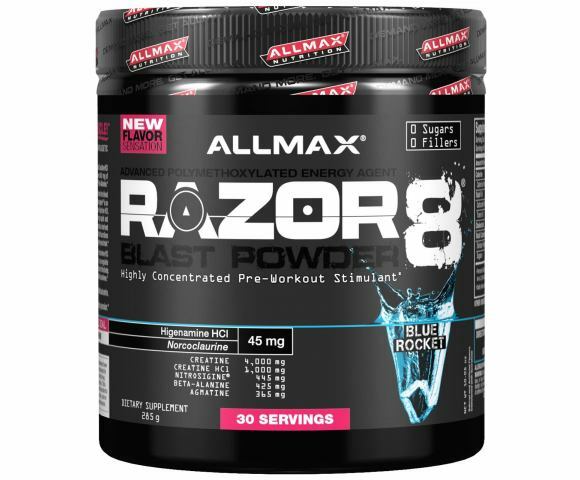 Razor8 Blast Powder features 640 mg of Arginine HCl, Pyroglutamate and Ethyl-Ester combined with 425 mg of BetaSynth Beta-Alanine. Multi-patented Nitrosigine is the latest in Nitric Oxide technology delivering 4 times the blood flow with truly impressive bioavailability and even more impressive results! Nitrosigine is so powerful that preliminary tests indicate 5 times the blood vessel expansion over Arginine HCl. The Nitrosigine molecule stability in the body appears to be the key ensuring rapid and sustained Nitric Oxide levels. Get the ultimate perpetual pump with 100% Fermentation derived Agmapure Agmatine Sulfate. HydroMax is a proprietary high-potency glycerol that functions to draw water away from skin and into the blood; get a more vascular drier look every time you train. The stimulating action of 3 caffeine analogs, Higenamine HCl (Norcoclaurine), Hordenine HCl (N,N-DiMethyl-Tyramine HCl), Yohimbine HCl with Yerba Mate Green Tea to upregulate thermogenesis and pure polymethoxylated alkaloids to dramatically extend their action in the body. In combination, these core compounds have a synergistic effect that you have to feel to believe. Razor8 Blast Powder is the Real Deal. Take 1 serving (1 full scoop) before intense training with 4 to 6 oz of cold water. Ideal for use before intense physical activity. Stay adequately hydrated. Note: Highly concentrated. Never exceed 1 scoop at one time. Not for use by individuals under the age of 18. Do not use if pregnant or nursing. Consult a healthcare professional prior to use if you have, or have a family history of heart disease, diabetes, high blood pressure, depression or other psychiatric condition, glaucoma, or seizure disorder; or if you are using a monamine oxidase inhibitor (MAOI), lithium, any prescription drug, or any over-the-counter drug. Avoid other sources of caffeine during use. This product is not intended as a substitute for sleep. Keep out of reach of children and pets. Store in a cool dry place.